Carr, Waldo E. ; Johnson, William H. ; Updegraff, Martin G.
Received for record on the date indicated in date column. [signed] Waldo E. Carr Dep. County Clerk. 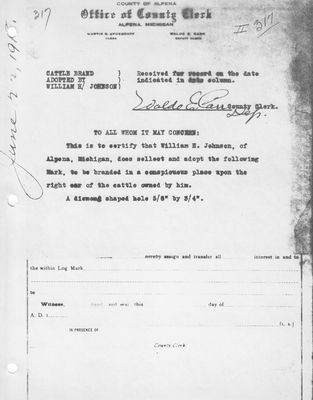 This is to certify that William H. Johnson, of Alpena, Michigan, does sellect and adopt the following Mark, to be branded in a conspicuous place upon the right ear of the cattle owned by him. A diamond shaped hole 5/8" by 3/4".